After 22-plus seasons in the NFL, Adam Vinatieri has figured out how to thrive in pretty much every element: rain, wind, sleet, snow, ice and mud. INDIANAPOLIS (AP) — Adam Vinatieri’s weekend preparations have already kicked into full force. He’s working with wet footballs, determining his best footgear and getting ready for another potentially big day in messy weather. It’s become a trademark of the NFL’s best clutch kicker. So it would be fitting if Vinatieri breaks Morten Andersen’s career record for field goals in a rainy, windy Washington this weekend. Vinatieri doesn’t spend much time worrying about forecasts because the South Dakota native has produced some of his best work in the worst of times. Nobody will forget the two kicks he made in the Snow Bowl , or “Tuck Rule” game, to help New England beat Oakland in a divisional-round playoff following the 2001 season. It helped the Patriots capture their first Super Bowl. Last week, in the controlled environment of Lucas Oil Stadium, the 45-year-old kicker calmly made 3 of 4 field goals to move within striking distance of Andersen’s career mark (565). Vinatieri is at 562. He’s also 47 points away from breaking Andersen’s career scoring record. Technically, Vinatieri already has more field goals than Andersen, who finished with 583 including playoff games. Vinatieri is the NFL’s postseason record holder for scoring (234) and field goals (56); he has 618 counting the postseason, including two Super Bowl winners in the final minute. But his favorite kicks don’t even show up in the league’s official count. He’s played for two Super Bowl-winning, Hall of Fame coaches in Bill Parcells and Tony Dungy, and a third, Bill Belichick, who seems like a shoo-in to make it when his career ends. He’s played with two of the league’s greatest quarterbacks, Tom Brady and Peyton Manning, and a third, Andrew Luck, who just might join the list one day. He’s won four Super Bowl rings, was the only unanimous selection on the Super Bowl 50 Golden Team, and has participated in a league-record 225 victories. 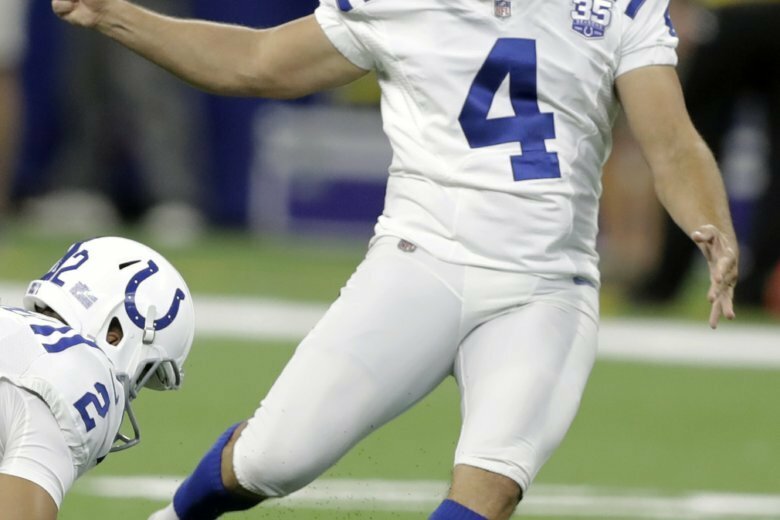 Strangely, though, if Vinatieri does break the field goals record this weekend or this month, he’s likely to do it with two unfamiliar names assisting: long snapper Luke Rhodes and punter/holder Rigoberto Sanchez. Both are in their second seasons with the Colts. Rhodes was 4 years old when Vinatieri was a rookie in 1996, while Sanchez was 2. But neither has a choreographed script for a celebration. They’d rather let Vinatieri handle that part on his own — especially if it comes in a muddy mess this weekend.